The older I get, the more I value people who are unapologetically true to themselves. Don’t feel like going to the party? Stay at home, open up a bottle of rosé and call it a night. Feel like painting an oversized abstract piece directly on your living room wall instead of hanging art? Throw on some overalls and grab some brushes. Go gray instead of dyeing? Let those silver locks shine in the sun. It’s so refreshing when people do what they want to do and are exactly who they want to be without wringing their hands over what anyone else thinks. That’s precisely the kind of woman I found designer Staci Snider to be when we caught up, while she was vacationing in Austria, recently. 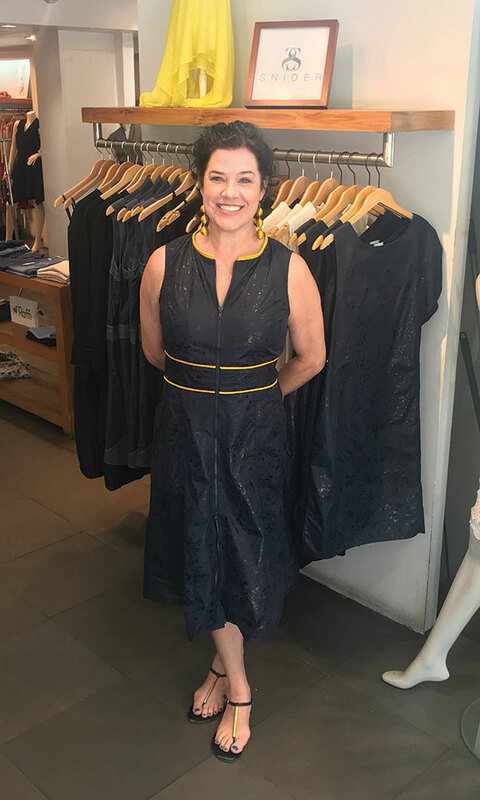 After years of living abroad, the Saratoga Springs native has reestablished her roots in town, and is now creating an eponymous line of women’s ready-to-wear fashion. “I’m not really a fan of living in New York City,” Snider cheerily offers when I ask why she isn’t immersed in the heart of rag trade action. “I do love the theatrics of fashion shows, but I just work better closer to nature.” The self-described “epitome of a Saratoga girl” grew up going to the orchestra, ballet and Saratoga Race Course (naturally), as well as skiing, and was always surrounded by art and books. “It took me a while to find my creative voice, but I’m here because I wanted to create balance in my life,” she says. Snider, whose surname is serendipitously German for “tailor,” earned her master’s in fashion at the Academy of Art University in San Francisco. She also happens to be a former world-class track athlete, and that sense of utility and ease of movement has proven to be highly influential in her designs. Her signature drawstring skirts and dresses, large pockets and strategically placed zippers, let her clients get down to business while quietly standing out from the crowd. “My clothes empower my clients,” says Snider. “They know they’re going to be the only ones in the room wearing them.” Her clients, who include CEOs, gallerists and DC professionals, appreciate not only the friendlier price-point than that of most of her peers, but also the fact that Snider’s designs succeed in doing what women all over planet Earth want: hide their weaknesses while highlighting their strengths. “It’s about streaming,” Snider says. ”It’s about creating an illusion.” Her designs are available at Jolie Jordan Boutique (JolieJordan.com) in Mount Kisco, NY and select boutiques nationwide. Snider cites flame-haired chanteuse Florence Welch and actresses Tilda Swinton, Diane Kruger, Kristen Stewart and Rooney Mara as some of her dream clients, and it only stands to reason that a fashion designer, who would choose a rose garden over the runway, would put together such a list of creative renegades. “It’s important for a woman to represent who she truly is. It’s about self-expression, not following trends,” Snider says. “I’m basically how my brand is—edgy but not severe. And that’s also Saratoga.” I couldn’t agree more, and I’m glad she decided to bring her talent home; we need more Staci Sniders here.